In honor of Halloween here is one of the few photos I took at this years Hallowbaloo block party in downtown. 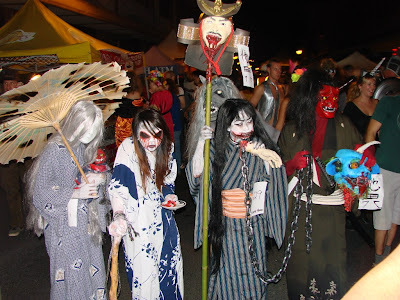 This is a group of Japanese Obake (ghosts) that were roaming the streets. I took this just before our “trick or treat” which turned out to be a Tsunami warning. It was quite interesting with word spreading through the block party that the entire area had to be evacuated. Certainly makes it a memorable day though unfortunately that cancelled the costume contest. The good news is only a small wave hit Hawaii and there was very little damage and no loss of life. For the next several days we will be running Halloween themed photos then we will return to Iolani Palace. Here is King Kalakaua’s library on the ground of Iolani Palace. 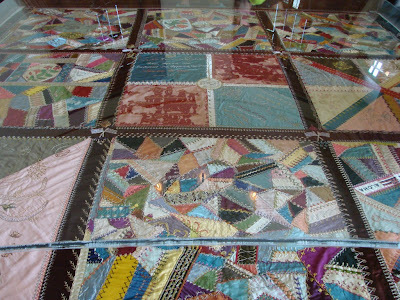 King Kalakaua was instrumental in installing innovate devices into the palace during its construction. He had toilets, sinks with running water, electric light and telephones. 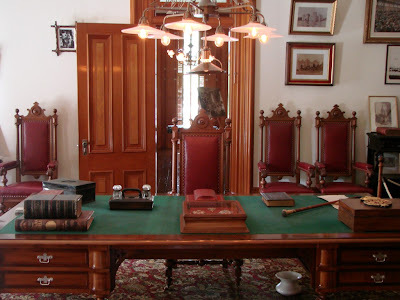 After the overthrow of the Monarchy this room become part of the Governor’s office but it has been restored into the library of King Kalakaua. We will be taking a brief Halloween break and then conclude our Iolani Palace series.